India have slipped one step in the ICC team rankings . 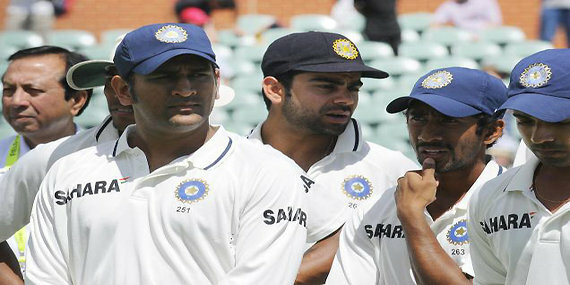 Now India is in fifth position after their 1—3 demolition at the hands of England in the recently-concluded five-match series. India conceded six ratings points after they touched a new low by succumbing to their heaviest Test defeat (an innings and 244 runs) in 40 years in a match that got over well inside three days at the Oval against England. The result helped England earn four rating points and climb up two places to third. Meanwhile, Sri Lanka have also moved up one place to fourth after winning the two-Test series 2—0 against Pakistan, which in return dropped two spots to sixth. India and Pakistan are on equal ratings points at 96, but Mahendra Singh Dhoni’s side is ranked ahead of Misbah-ul-Haq and Co. when the ratings are calculated beyond the decimal point. Number-one ranked South Africa are sitting pretty on the top while Australia are just one ratings points behind them. In the Test batsmen’s chart, Chesteshwar Pujara is the lone Indian in the top-20 list. He lost four positions to be at 16th. Indian bowlers Ravichandran Ashwin (13th), Pragyan Ojha (15th) and Ishant Sharma (20th) figured in the top-20 list.